The Lubavitcher Rebbe’s teachings on the costumes we wear all year round. There were about 15 people there for the megila reading, in the square across from the bus station, and we were about half-way through the megila when one of the drug addicts who hangs out there came over and started yelling and cursing at us, demanding that we give him money. I felt irritated. 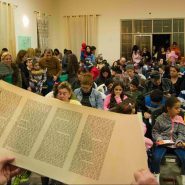 There we were, on the holy day of Purim, listening to our megila reading. And this gross person was coming over and bothering us! And, unbelievably, the drug addict just nodded silently and walked away. It was an astonishing interaction for me to see. To witness the respect with which the Chabadnik treated this drug addict–whose appearance as well as mouth were so disgusting. And it was equally astonishing for me to see how quickly the drug addict responded to the Chabadnik’s request to let us read the megila in peace. This morning, Sivan Rahav Meir provided an explanation for that mystifying interaction between the Chabadnik and the drug addict this Purim. The Lubavitcher Rebbe taught that when you see a person dressed up on Purim as a scary animal or a clown, it doesn’t occur to you to get mad at him or to be scared of him or to take him seriously. Because it’s just a costume! This one’s dressed up like a person with chutzpah, this one’s obnoxious, this one’s apathetic–but that’s not their true character. It’s actually just their costumes. We need to remember their good and pure inner essence underneath all that. And maybe we can even help them, gently, to remove those costumes they’ve put on. The Rebbe’s wisdom doesn’t only apply to drug addicts disrupting megila readings. When we, in our lives, look around us and see obnoxious kids, irresponsible husbands, dishonest neighbors, and insufferable sisters-in-law, we can remind ourselves what lies underneath their costumes, as well as our own–the holy of holies, a perfect Divine soul. I love this! It’s so in tune with the Sefer Tomer Devorah which I’m studying right now- we are meant to have compassion for all Jews, no matter how they act and insult/offend us. When we do this we are emulating Hashems great compassion for all his creations and we bring down a tremendous light of Rachamim. Thank you again for all your wonderful posts which cheer up moms around the world! Amazing Post!!! Words we should strive to live by! Thank you Chana, once again, for pointing out the positive when confronted with what seems negative.I think the words’AS WELL AS OUR OWN’ in the last line should be capitalized in bold!! May we all have the wisdom to remove our own ‘costumes’ and let our true inner self come out of hiding. This is so awesome Chana Jenny, thank you, thank you thank you!! I absolutely loved this post. THANK YOU! Where did you video? Beautiful setting!